In the middle of downtown Toronto, not far from the hub that is Yonge and Bloor, lies a European kind of street: Earl Street. A street that changes its name, block by block. Walking in a city like Berlin, many streets will seem like the same street, but unless you're checking the street signs, the names often change. In Berlin's neighborhood Mitte, Chausseestrasse becomes Friedrichstrasse where it gently bends at the Torstrasse intersection. Torstrasse itself becomes Mollstrasse and eventually Landsberger Allee as it heads further east. Most of the streets on this side of the Atlantic tend to keep their name for a long time, but not Earl, which runs two blocks between Jarvis St. and Sherbourne St. in the "Upper Jarvis" neighbourhood. Toronto is largely laid out like a grid, with some exceptions, but this neighbourhood is firmly in right-angle territory, so there's not even a hint of curve that might suggest a street has changed its name. Earl's short existence belies its actual length as a continuous street. Beginning at Yonge Street, another street, Gloucester runs for just two blocks to Jarvis where it becomes Earl Place. Gloucester has a mix of Victorian homes and mid-century modern apartment buildings. The two styles and eras blend together with an unexpected ease, a mix Toronto often does well due to its heterogeneous look. No one style dominates, so everything belongs. There may be a connection with Toronto's multicultural identity and this heterogeneous built form; everybody can come here and find something either familiar or a style they like. For the first half of Earl, it's known as a "place," and the second, longer stretch is a "street". Calling a street a "place" suggests it's diminutive in some way, but a cute kind of diminutive, perhaps even quaint. Earl Place has a bit of all that with a handful of rather handsome pre-war walk-up apartment buildings, and two rows of relatively new row houses, one that tries to imitate the Victorian form, the other that embraces a more contemporary style. The faux Victorians aren't awful in any way, but the trying-to-be-old respectability always seems a bit odd. Why not relax with newness? Earl Place ends at Huntley Street, though it once continued through to Sherbourne and Huntley forming a standard T-intersection here but because of a late 1980s or early 1990s street engineering project, based on the style of the concrete bollards, a dead end was created to prevent cars from scooting along this mostly residential street, instead forcing them a block north along Isabella Street. Earl is one of the "dead ends" in Toronto that has a “No Exit” sign but it only applies to cars as people on foot or bike can pass through easily. There are cut-outs in the cement curb that allow small wheels to roll through. The dead end here makes for a quiet pocket of the city, good for dog walking as there's not much worry of cars, but there is opportunity here to do something even nicer, perhaps adding planters or even some benches, something that gives people a reason to linger rather than keep moving. Toronto is still learning how to make its public realm relaxed and inviting. Still, this porous barrier, the kind all city barriers should be, is the half waypoint in our Earl of many names length. From the Huntley dead end, Earl Street continues east along a long a stretch of Victorian townhouses with a stone marker at one end that reads, "Windsor Terrace 1877". These, too, are across from newer versions of row houses, these ones part of a condo-style community. They look like the same kind of place as the older ones — homes built side by side — but the newer homes are all attached via underground garage with just one entrance; old styles done the new ways. About half way along on the south side, the manse for Our Lady of Lourdes Catholic Church is set on a large lot. The church itself faces Sherbourne and is, as churches here go, oddly shaped with what seem like two distance buildings with a sculpture in the middle that depicts the scene at Lourdes. With a garden this is another lovely pocket, though not many people linger here either, unless church is letting out on a nice day. Until recently there was a fantastic view of the church from across the street where three tall apartment buildings were connected together by a massive second storey platform that was a few acres in size. A park-like space with paths that meandered between trees and patches of lawn, few people would ever venture up there, or even know it existed as there were only a handful of stairways up. The public space below was forever dark, and Earl Street became St. James Avenue as it passed underneath all the concrete. There was little to invite people in, or welcome returning residents. That's all changed as the upper deck has been largely torn down and while the crumbling upstairs park was interesting as an adventure through the brutalist style of architecture — think lots of raw, exposed concrete framing all the park space — its removal has created what could be a grand new entrance into St. James Town. A walk along Earl's 19th century streetscape provides a nice view of the St. James Town towers now as they curve, as St. James Avenue doesn't stay true to the Toronto grid but rather gently snakes its way through the neighbourhood, finally ending at Parliament Street and St. James Cemetery. In the summer time, midway through the neighbourhood, informal markets will spring up, so there's lots of potential to turn this neglected stretch into a desirable place to come to for the markets or just to see other people. Often the hardest part in urban design is getting people here. In St. James Town, they're already there. From Yonge all the way to Parliament, this could be a new downtown eastside corridor, knitting together a few neighbourhoods and providing a better and more welcoming connection for the over 20,000 people who live in St. James Town with the rest of Toronto if Earl could, with some attention to design and with markers that encourage flow, become a little more like a Berlin street that inherently invites people to walk down it and discover what's next by providing a pleasant pedestrian environment. As it is now, St. James Town is a kind of island floating off the east side of downtown, separate by mind and imagination rather than geography. 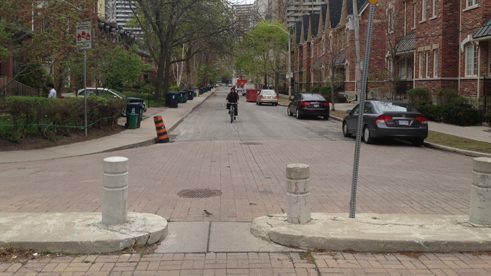 The destruction of the concrete barriers may be the best opportunity yet to reconnect this neighbourhood with the city around it. Shawn Micallef is a Toronto Star columnist, editor and co-owner of Spacing magazine, a University of Toronto instructor, and author of "Stroll: Psychogeographic Walking Tours of Toronto" and "Full Frontal T.O." His last book, "The Trouble with Brunch: Class, Fashion, and the Pursuit of Leisure" came out last summer.